Reproducibility in Biomedical Research: Epistemological and Statistical Problems explores the ideas and conundrums inherent in scientific research. 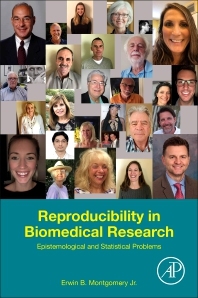 It explores factors of reproducibility, including logic, distinguishing productive from unproductive irreproducibility, the scientific method, and the use of statistics. In multiple examples and six detailed case studies, the book demonstrates the misuse of logic resulting in unproductive irreproducibility, allowing researchers to develop their own logic and planning abilities. Biomedical researchers, clinicians, administrators of scientific institutions and funding agencies, journal editors, philosophers of science and medicine will find the arguments and explorations a valuable addition to their libraries. Professor Montgomery has been an academic physician/scientist for over 40 years and has held tenure as a full professor at several major academic universities and centers including University of Wisconsin-Madison Medical School and University of Alabama at Birmingham, Medical School. He has published over 100 peer-reviewed scientific and scholarly journal articles and 6 textbooks in neurology, neuroscience and medical epistemology. Professor Montgomery has received numerous scientific grants including from the National Institutes of Health, has served as an editor of several professional journals, and been a reviewer of grant applications and papers and received numerous teaching and mentoring awards.